Hello! 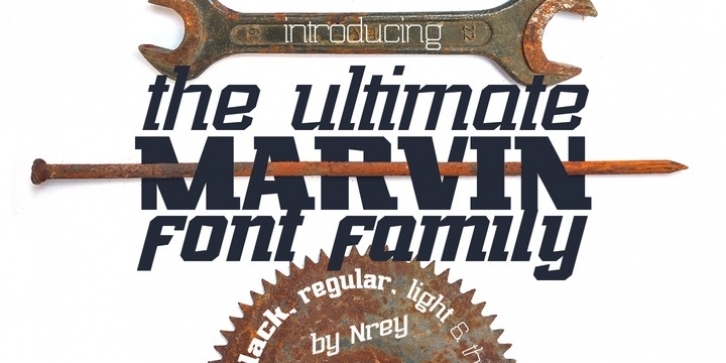 Happy to present the ultimate MARVIN Slab font family - slab serif typeface. Font inspired by Marvin Heemeyer history. It have 8 weights from strength, massive forms as bulldozer, to easy light thin lines. Font looks amazing as alone words and as full text blocks. Also it good for bright captions and unforgettable logos It have supporting for many languages as: Czech, Danish and Norwegian, Deutsch, English, Espanol, French, Italiano, Magyar, Nederlands, Polish, Portuguese, Finnish, Swedish, Turkish, Russian and other based on extended latin.